First lady Michelle Obama campaigns for U.S. Senate candidate Bruce Braley during a rally at the University of Iowa on Tuesday in Iowa City, Iowa. Electoral junkies — ourselves included — have been fascinated by the prospect Republicans may lose races in red Georgia and redder Kansas. We shouldn’t lose sight of the fact, however, that Republicans don’t need to win either of those races to win the Senate. Republicans need to pick up six seats. According to FiveThirtyEight’s latest Senate forecast, Republicans have at least a 78 percent chance of picking off seven seats. In declining order of likelihood: Montana, West Virginia, South Dakota, Louisiana, Arkansas, Alaska and Colorado. If the GOP loses Georgia and Kansas, they’re down to five. That’s why Iowa is key. If Republicans win it, then they can afford to lose Georgia and Kansas and win the majority without pulling off an unexpected victory in New Hampshire or North Carolina. It’s no mistake that Republican Joni Ernst’s chance of winning in Iowa, 66 percent, is nearly the same as the 64 percent chance Republicans have at taking back the Senate. On Thursday, Quinnipiac University released a survey, and — for the second week in a row — found Ernst ahead of Democrat Bruce Braley by 2 percentage points (48 percent to 46 percent). Along with a Gravis Marketing survey showing Ernst up 6 points, her average lead in the 13 nonpartisan sponsored polls conducted over the past month has been just 2.2 percentage points. It’s even smaller in the our projection (which accounts for pollster accuracy, house effects and state fundamentals) at 1.3 percentage points. 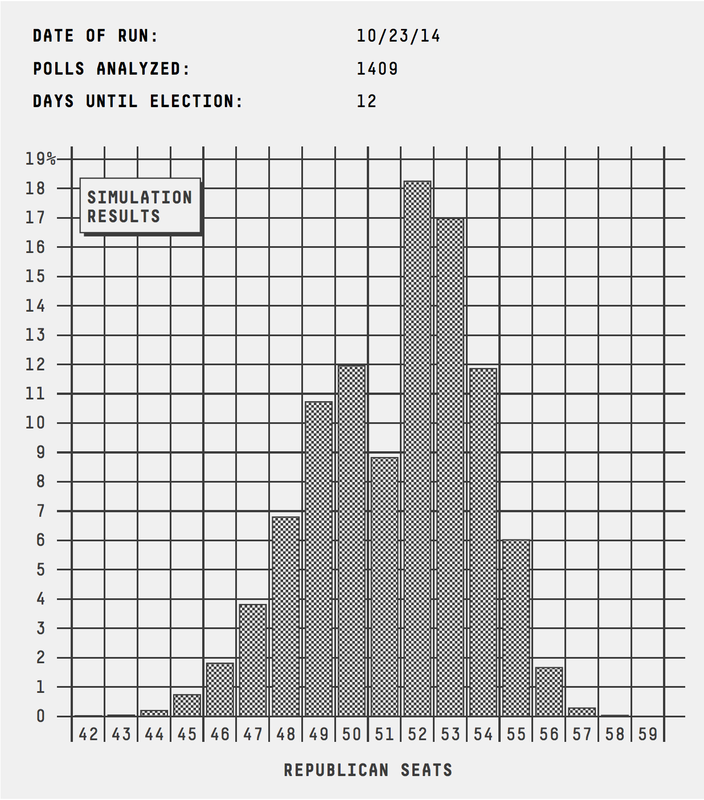 But Ernst’s advantage doesn’t come only from the polling average. It also comes from how consistent the polls have been. Including Thursday’s polling, Ernst has been ahead in 10 of the past 13 independent surveys. She has been tied in two and losing in just one. This is similar to the polling in Colorado and in the 2012 presidential race in Ohio. The leading candidate’s advantage is small, but the polls are all clustered tightly around the average. The FiveThirtyEight model takes into account this lack of deviation. The model projects Ernst to win with more certainty because the polls are in close agreement. Are the polls wrong? They could be. But Democrats shouldn’t count on it. There are no signs in the early voting numbers that Democrats are cooking up something that pollsters aren’t picking up. Both sides are turning out about the same number of their voters, while Democrats are leading among independents. The Democrats’ edge among independents is reflected in the Quinnipiac poll, which found Braley leading among people who have already voted by 21 percentage points. Still, however you measure it, this is a close election. Ernst is a 66 percent favorite — a far cry from a lock. And Braley has 12 days left to make something happen. Democrats shouldn’t count on a polling error in Iowa, but an error is always possible; Ernst’s lead is small, even if it is consistent. But if Ernst does win, Iowa gives Republicans more room for letdowns elsewhere, and that could prove crucial in determining who controls the Senate.